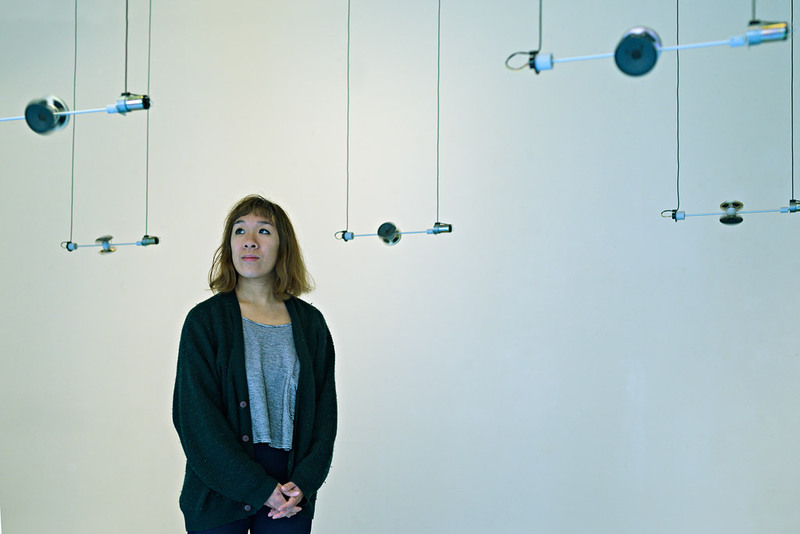 Gabey Tjon a Tham (NL) transforms spaces into a sensory environment through kinetic machines, light and sound. She observes simple behaviours and patterns in nature from where she extracts and assembles fundamentals. Her work explores relationships between humankind, nature and technology where unpredictable processes, conflict and harmony are important subjects. She develops techniques, invents mechanical sculptures that embed different materials and perform at different poetic levels. Hereby choreographies that have both a mechanical and natural character arise. In every work, the elements are constantly evolving thus demanding patience and attentiveness to fully reveal themselves. They invite us to wonder at, contemplate, and investigate. With each work she aims to create immersive spaces where we can experience how the world touches us. The patterns in your work are quite organic. Can you talk about your inspiration from nature? Even though my works evoke strong associations with natural phenomena, it’s not my aim to simulate these. I like to explore their underlying structures that can be understood from a more fundamental level and can be present in us as humans, technology and nature. Processes that are found at moments of inception or subsiding and not necessarily found in pretty flowers, majestic trees or bold landscapes. But rather in the minor, tentative, hidden and ephemeral: things so subtle and evanescent that they are invisible to unrefined eyes. I’m interested in questioning what nature is as our relationship with nature is changing. Untouched nature is almost nowhere to be found as ‘we have been here’ echoes all over. We are living in a time in which the ‘made’ and the ‘born’ are fusing. While the old, current aspects of nature, such as trees, plants, animals, atoms and climate are increasingly controlled by mankind, effectively turned into a cultural category. At the same time our technological environment becomes so complex and uncontrollable that we start to relate to it as a new kind of nature. Where technology and nature are traditionally seen as opposed to each other, they now appear to merge or even trade places. Can you describe the process of your work? How do you translate ideas into concrete works? Usually I delve into a certain topic for a longer period of time, which can take up to a few years. I’m gathering different perspectives through theoretical, technical and material research that results in one or multiple installations. Usually an idea for a new work starts with a familiar, but still unclear image of a space that serves as a point of departure. This can be a colour, form, a sound that evokes a certain atmosphere. The digital and physical material I’m working with are a combination of high and low technologies that are quite elementary and don’t have a significant meaning yet. Like a motor, speaker or LED. Each work is like inventing a new medium or an instrument that has a logic on its own for which I have to develop a new vocabulary. I keep track of my research and development on my blog, which is more of a personal source of ideas, preliminary sketches for the installations I have made so far and want to make in the future. During the process of creation the content develops along the way where I’m trying to apprehend my medium by forming the material with the image I have in mind, but also allow space for unpredictable behaviour of the material to happen. It often doesn’t want what I want it to do. In this way I form my material, but the material also guides me during the process. I consider my material as a kind of nature which allows me to construct a microecology that serves as a mirror to ourselves and the world around us. The final work becomes something that goes beyond this initial image that I was talking about. It is an experience that triggers the imagination of the spectator, rather than something that needs to be understood. Can you describe it on a concrete work of yours, for instance, the installation Red Horizon, commissioned by TodaysArt & MoTA? In Red Horizon, I continued to develop the techniques and mechanics that I have used in ))))) repetition at my distance to explore new expressions of light, sound and movement by using different materials and ways of use. The image of a swarm consisting of white particles creating geometrical and organic forms in a dark space motivated me to create new work. During a one month residency at MoTA I developed the first prototypes for Red Horizon where I made three kinetic/light/sound sculptures that control a set of groups differently. I was looking for another way to make a composition in time for an installation that consists of multiple entities. Instead of controlling the units separately, I wanted to create a system that controls them from a meta-level by setting simple rules of boundaries for them to move freely, which also made them more unpredictable. In ))))) repetition at my distance the composition is linear and has a clear beginning and an end and I wanted to break this cycle by developing a system that directs itself and keeps evolving. My point of departure for Red Horizon was working with complex and emergent systems that were inspired by theories of early cybernetics – a transdisciplinary science from the 40s exploring the control of biological and mechanical systems. In the end, I made different pieces that created complexity through delays in the timing of the speed and directions of the motors, the brightness and flickering of the LEDs and the spatiality of the sound source. Also, I was wondering if complex behaviour could be present in a mechanical system and ended up with bringing the ‘white particles’ that I had in mind into motion with a double pendulum. What makes this mechanism special is that the second arm always behaves unpredictably although it depends on how the first is controlled by a motor. The second arm turns together with the first and therefore generates a chaotic behaviour, which creates the natural character of the work. In Red Horizon, each arm of the pendulum contains a white light and a small speaker that moves along the unpredictability of the mechanism and draws these after images in your eyes. Often each work consists of materials and techniques that I’m not really familiar with. Many of the elements have to be custom made, since that particular mechanical part, electronic circuit or piece of software programme doesn’t exist and has to be build. It’s a challenging, but also exciting journey spending hours browsing the internet, learning tutorials, exchanging knowledge and working with engineers and fellow artists. I guess many new media artists share this way of working and also the art community in the Hague is a great place to meet and collaborate with creative people coming from various different fields. What role do humans and humanity play in your work, also in relation to the Anthropocene/post-Anthropocene context? Even though our daily lives are controlled by complex digital technologies it’s difficult to grasp their inner workings, because of their ambiguous character. In my work I’m interested in exploring the natural side of technology more, which is not based on ideas of a society driven by efficiency, innovation and exponential growth. I try not to see humans as the anti-natural species that merely threatens and eliminates nature, but rather as catalysts of evolution. What drives us to invent technologies to design our environment? I’m currently working on some scale models for sound sculptures that explore feedback loops and hope to realise one of these on a bigger scale. It is part of a research that I started during the 10-day residency ‘how do we save time?’ at Timelab in Ghent last November. I wanted to work on ideas for a new installation that explore a different perspective on technology that is not driven by efficiency and with a different use of time that is closer to natural processes and human experiences of time. I made the first model for an interactive two-channel sound installation where two seats incorporating one speaker each are positioned opposite one another. Each seat has its own sound source of a bird flapping its wings. A natural rhythm that will only work when two people are sat down, which closes the ‘loop’ and connects them through a shared experience by processing the two sounds coming from each chair through a custom-made effect where its output is fed back into its input and therefore changing the sound continuously. For this research I was influenced by the ideas of mathematician and philosopher Leibniz (1646-1716). He devised the modern binary number system, which is the foundation of virtually all digital computers and was considered as the patron saint of Cybernetics. His ideas were of great influence on the origins of our digital universe and therefore the beginning of the development of our information society. In contrast to efficiency, Leibniz’ binary system was inspired by the Chinese philosophy I Ching, the book of changes. It described a microcosm of the universe through a symbolic construction of the processes driving change. What struck me was that he found some sort of confirmation for his theories in I Ching’s depiction of the universe as a progression of contradicting dualities, a series of on-off, yes-no possibilities, such as dark-light and male-female, which formed the complex interaction of life and consciousness. I noticed I felt more connected to Leibniz’ ideas, rather than the applications of his binary system today. We both have the motivation to construct a universal language through scientific and metaphysical concepts that comprise life and consciousness.